Pictures is an easy way to view your pictures. It allows you to view them as a slideshow with nice transition effects and even allows you to listen to your music while viewing your slideshow. Once a Picture is selected / displayed, you can rotate it with the R key on a keyboard. The O key on keyboard will toggle Picture information on the picture being displayed (dimensions in pixels, filename and order in slideshow and more). The ← → keys on the keyboard will go to the next / previous picture in the Slideshow. This can be performed while viewing individual pictures or in a slideshow. While viewing press 0-9 on remote or keyboard to zoom in and out. While zoomed you can use the ← ↑ ↓ → the keyboard to scroll the edges of the picture. Note: If done during a slideshow, it will pause it until you stop pressing a button. If you are zoomed in during a slideshow and the picture changes it will not keep those setting from one picture to another. The SlideShow function will start a sequential slideshow of all the pictures in the current folder with some nice transition effects. You can enable/disable the transition effects in Settings/Pictures/Slideshow. This option will display a slideshow using all images in the current folder and all of its sub-folders. It must detect sub folder in a directory to activate the option. 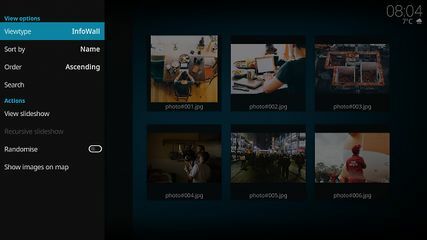 When selected, Kodi will display the slideshow in a random order. In order to play music with your slideshow, simply start a music source (playlist, song, etc} and then start the slideshow. The music will play in the background. Sources are an important aspect of Pictures. Setting sources allows you to easily access your picture collection. USB HDD's, Cameras with USB port, USB keys. Card Readers, Internal or external. On CDs/DVDs in the CD/DVD drive. Note: See main article Media Sources for a complete list of available sources. CBZ and CBR are comic book archive files, they are pictures/image stored in CBZ (a renamed ZIP-archive) or CBR (a renamed RAR-archive) format. CBZ and CBR comic book archives are automatically parsed by Kodi (as long as the image-format is supported) so that you can view/read, browse and zoom the pictures it contains. Viewing CBR files in Kodi 18 Leia for Windows and upwards will require you to install the RAR Support add-on. You can create comic book archives yourself on your computer: Your images should use a compressed format such as JPEG or PNG. Then the easiest way is to copy all images into a new folder, name them properly, ZIP/RAR the folder, and rename it to *.cbz respectively *.cbr extension. Though not required, you should configure your ZIP/RAR tool to not compress the files, instead only use the "store" option, (this hardly increases the size of the final archive, but speeds up opening the archive a lot). Note that the preferred comic book archive is CBZ (i.e. ZIP) simply because ZIP tools (and libraries for those who which to create comic book archive readers themself) are more readily available.